Inside I was screaming, but neither are tech savvy. So instead of being hurt or angry I took the time to tell her about how it works! like "Can you draw ------- character for me by lunch break?" "So, Let's see our character jumping and skating by this evening hmm? :)....you know animation right? I was just wondering how would it look for the thing I'm thinking about :)--oh and yeah, put some of your 3D stuff into it..."
Once I tried to sell prints of my painting to a gallery downtown. The lady said she didnt sold digital paintings because they're not real and thus, have no value. That's pretty narrow minded. Prints of digital paintings don't have the SAME value as traditional paintings, but that hardly means they're not worthless! I think it's totaly ok if traditional painting are much more valuable. Because it's exclusive thing. It's exist just in one piece usualy. Digital painting prints you can sell as many as you want. Find a different gallery. They don't sound like a good fit for your work. That's fine, as long as you don't delete my credits. Thanks for asking! Truth. 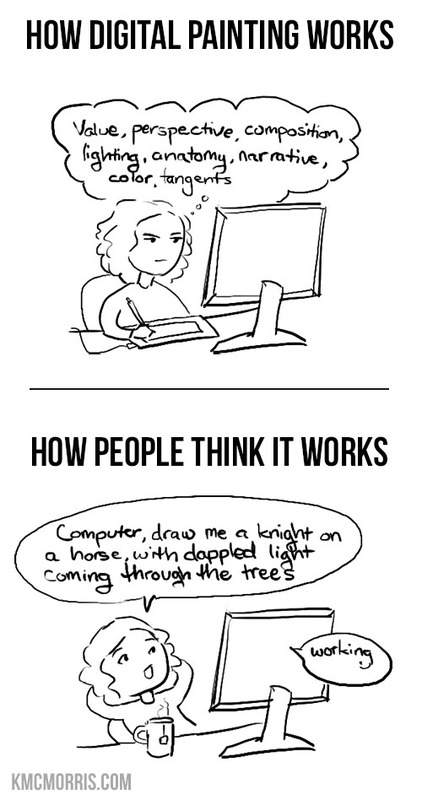 Sadly, even many digital artists think the same about 3D art. Why is the girl in the cartoon right-handed? Wrong. So wery wrong. International truth! "Oh, well, anybody can do it, with a computer!". Yeah. Just so appreciate this Kelley - it's very hard to get people to understand how much actually goes into a digital painting and hopefully, it will be seen as true fine art as it should be.